A marketer, writer and mother originally from New York City and now living in Deseret. Reader Question: How Did I Get Here? In the past, I've answered reader questions here and here with the help of several trusted friends. This question answered this week was sent in by a listener during a KUER Radio West program in the fall in which I, along with several other women, discussed why Utah was ranked by one publication as the "worst" state for women. How would you answer this woman's question? If you or someone you know has a question you'd like to pose to me and a panel of other trusted women, please email me or message me on Facebook. "As a 44-yr-old stay-at-home mom, I am sorely tempted to blame my LDS culture for significantly narrowing my life choices. My youngest of five children entered first grade two months ago. I'm home today using craft paint to fix the dings in my Fall-themed pottery and planning my lavish Christmas decorations on Pinterest. I'm mad. How did I get here? I guess I have to own my choices and stop playing victim. Yes, I was strongly socialized to choose the path that I did. Yet,I have friends and you have women on your panel today who managed to pursue a professional course that I now envy. One of them mentioned the powerful female role models they had at home. I think my biggest regret is not being that role model now for my four daughters. I'm anxiously trying to connect my daughters with these type of exemplary, empowered women." It's been a few months since I received this question, and I had sort of forgotten about it over the holidays, but it came to the forefront of my mind after my post last week about a recent New Era article directed at young women. Although many people agreed with my assessment that the article's advice to girls is too narrow, several people in unpublished comments here and directly through Facebook expressed dismay that I would be critical of a church magazine's efforts to remind girls of their priorities and eternal responsibilities. This question posed above is the best retort I could have conjured for those who think I was making a big deal out of nothing. This question demonstrates the inner turmoil that a too-narrow narrative can create when not tempered or broadened with additional messages or encouragements. This is the kind of crisis of identity that I seek to lessen when I encourage us as a people to abandon the either/or rhetoric. How can a woman who has mothered five children in the gospel be "mad"? Because she resents not being more fully encouraged to be both a mother and her own person. She is figuring out for herself at 44 that life's path doesn't have to be an either/or proposition and that the too-narrow narrative can lead to crippling regret. The women here asks how she got to this point in her life, and she's prepared to take responsibility for the choices she's made thus far. But what I hear her really asking is why there were few women in her own younger life who perhaps showed her that both/and model, and how she can provide those models for her daughters. I've spoken in the past about the importance of role models as ways that we spiritually create various paths for ourselves before we actually physically create them, like flight simulators where we can try out a life from the comfort of our chairs before launching into it ourselves. I think this mom is doing a heroic work for her daughters by seeking out those types of models for them, even if she feels she herself isn't that role model. That's exactly what projects like the Mormon Women Project are for: to offer alternative narratives of faithful women developing the whole person. We can do better offering those models to our next generation. Click here for this awesome series of photos of little girls transformed into their role models. (This almost could have been written by me, with a few details changed.) I think if she is able to find her own passion now that the kids are older and pursue something that feels meaningful to her, that will be an inspiration to her daughters. Constructive discussions with them about their future plans (beyond simply marriage & motherhood), and pointing out other paths with compassion instead of judgment would have been helpful to me growing up. Fortunately, MWP and other resources now give us great role models to share. 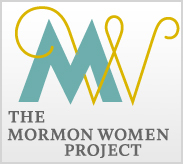 Differing "brands" of Mormon culture, which are not necessarily doctrinally based, are a sure culprit in discouraging women from realizing their full potentials as human beings within the Church. While Christ taught that we should be diligent in developing our talents and letting our lights shine, Mormon culture, as influenced by Western, 1st-world, 50's era mindsets, has enshrined women, almost like fertility goddesses, as Mothers above all, to the point of discouraging women to pursue careers before having children or discouraging women from serving full-time missions. These messages are fading from the pulpit as the reality of another economic depression hits and as the world becomes more full of members from third-world countries where women have to work and mother full-time simultaneously. Some parts of Utah, due to cultural quirks, have taken these potential stifling views even further, condemning women who have visible talents and successful careers, as well as looking down on those who choose to serve missions. These outlooks couldn't be further from scriptural truth, but have had and continue to have an affect on and act as vestiges of psychological corrosion on the souls of Mormon women, especially those who have grown up solely in Utah. I spent the majority of my youth outside of Utah and was raised by parents who encouraged the development of all of my talents, so I was lucky enough to never have been discouraged from pursuing my dreams and professional aspirations - I never perceived my career aspirations as being at odds with my aspirations to marry and bear children because the Spirit led me down both paths simultaneously in very obvious ways. The Mormon doctrine of continuing personal revelation and the importance of heeding such has been paramount to all the personal and professional decisions I have made. I have, however, experienced judgment from other members about my professional and personal choices and often feel conflicted myself about home and work balance. I consider it my civic duty to pass my knowledge on to those in my community who have talents I was born to help cultivate - that is very clear to me. But it is also equally as clear to me that I have an even more urgent and time consuming civic duty to raise happy, productive children, who can contribute positively to the world. I often feel guilty about NOT being more crafty and NOT decorating my home more lavishly around the holidays for the sake of my children, who yearn for rich and fun-filled home lives. I often yearn not to have been given any professional success so I could be a more fun mom and a mom with less outside distractions. I struggle with the very real worry that I will regret having been so professionally involved. But I try to be inspired on a daily basis, and I have learned that I can take my kids along for the ride and teach them valuable and fun life lessons in my profession as well. I have found that balance is the key, and you are never too old to pursue your dreams. Following the scriptures and your "inner voice", a.k.a., the Holy Ghost, can help you sort out this balance and the pursuit of further education and professional goals that will enrich your family in the long-run. It is possible to have it all - just not all at the same time. I want to say two things in response to this question. First, I think the real question is how many other women in their 40's who grew up outside of major metropolitan areas and are not members of the LDS church feel that their culture dictated many of the personal and professional choices they made in their lives. Women in their late 30's to mid-40s are in a particular spot when it comes to this issue. Many of us watched as the recession of the 70s forced our mothers to find employment outside the home to help make ends meet. Most of those jobs were so far from ideal: they were mundane, they were tasks. But we watched our mothers associate this sense of necessary suffering to their occupations, and we recoiled. This did not afford many of our generation a healthy view of what it meant to be a wife and a mother and a professional. Before we blame the LDS culture, I think it's important to carefully examine the broader American culture of that time. I won't deny that in many LDS circles there is absolutely a climate of pressure to be the cookie-cutter at-home mother whose greatest joy is found in every little thing her children think and do. That somehow there is something noble or more-righteous about a woman who chooses to abandon her own hopes and dreams and focus solely on those of her children and spouse. But what lesson does that actually teach our children? That their own hopes and dreams are finite? That their goals and aspirations have an expiration date? This leads to my second point. Go for it. I have several degrees in a field completely unrelated to what I now do professionally. I persuaded the University that hired me in my current role to hire me part time, though the job was full-time, so that I could spend my days at work and my afternoons at my other job...my family. Too often we throw around the phrase "magnify our callings" only in reference to our church responsibilities. God did not call me to this world only to work with the Primary or the Nursery or the Young Women. He gave to me a whole smattering of talents and abilities, and I plan to use as many of them as I possibly can, in as many ways as I possibly can, until I'm done. Connect your daughters to high-impact women around you, yes. That is always a great way to expand their horizons. But right this minute step forward onto the path to BEING one of those women. What do you want to do? What do you want to learn? How do you want to change the world, or your town, or your family? It is only too late to become what you're missing if you say it is. Much love and luck. One need look no further than the current Eternal Marriage student manual for several reasons why women have such ambivalence about pursuing their dreams/goals/education in addition to motherhood. The section on Mothers' Employment Outside the Home contains several dire warnings about failed marriages, "gangs on the streets of our cities, children killing children, spending their time in practices that can lead only to prison or to death", etc. "Numerous divorces can be traced directly to the day when the wife left the home and went out into the world into employment." This fear-based rhetoric very much permeated the teachings as I was going through the YW program and at as a student BYU in the 80s. This, unfortunately, resulted in my reluctance to challenge myself in areas where I had natural strengths. I now find myself stuck at a job I do not enjoy, but don't have the skills or experience to choose something more rewarding. It was very much either/or teaching. I can think of quite a few women in my ward/stake who started college, but dropped out to marry and have families. Very few ever returned to complete a degree. I don't have time for a long comment, but I could go on and on about this topic. You are right, Neylan: the either/or rhetoric, whether explicit or implied, has to go! We just have to stop it! So many of us have been hurt by it in both psychological and very real, tangible ways. There is a difference between general American culture giving us certain attitudes about work and motherhood, and being told to stay home, not be selfish, sacrifice and serve, not put off having kids, etc. by leaders of "the one true church" who, we may have believed as a kid anyway, communicated directly with God and spoke only the words of God. I know that many of us didn't feel we could think about being anything other than a mother. We didn't feel we had permission to choose a career-oriented passion or education. It's really sickening, and until we stand up and protest, collectively, it will keep keep coming (as your last post on the Ensign article showed). I am glad the sister who posed the question is helping her daughters to envision more for themselves, and I hope she is able to develop and find outlets for her own dreams. If we could get beyond the either/or rhetoric, we could actually work together at church to help people through the real-life challenges of work and home, no matter whether they are currently involved in only one of those, or both. Sorry -- New Era article, not Ensign. I'll play. I'm a stay-at-home dad. My issues are the same as Neylan (a dear and old friend) describes, without all the gender angst (or maybe just a different kind). I can't blame the Church for making me stay home; let's start there, right? When the kids were underfoot, I told myself that I would sacrifice my own goals, career-wise, until they were in school. The second the last one entered kindergarten (a full-day thing in New York City, where I live), I was free to act on all the ideas I had set aside, for years. I have made up for lost time, at least I think I have. My identity as a full-time caregiver is sporadic now. If I don't get much accomplished writing a new book, curating art exhibitions, researching history for publication, or writing articles for my corporate clients, I can't blame the kids (or my version of parenthood): it's all on me. That NEW ERA article was great at targeting the interests, the preoccupations, and the worries of young men and young women! I say that having kids ages 23, 20, 18 and 15. The editors are striving to promote what will engage (first the kid has to be interested in the message) and second, to offer support for what helps with those issues. My kids get all kinds of encouragement from their parents about 'doing hard things' and 'equal value of gender differences' etc! We are ALL products of the families and their values, as well as the culture we live in. I live in The South, where gender-based judgements abound. But the family relationships are still the strongest influence! Women who want to venture outside their family norms can find all kinds of support. I need the many influences of the gospel (including the New Era, if and when my kids find the articles worthy of their attention! ), to help give balance to the many options in their lives. I appreciate this question because this will be me in a few years! I don't regret any of the time I spend at home with my kids. But now, even with a degree in a discipline I love and several years volunteering in a related field, I have no idea what I'm going to do with myself when my last child starts school. I have some hobbies but I'm not interested in pursuing them as they won't challenge and stretch me as much as I'd like to be challenged and stretched. I wish as a sisterhood we'd spend some time on career development. This has nothing to do with proper priorities. It just addresses reality. Even for those of us who are full-time stay-at-home moms, there will come a time when our children don't need us to be home all day everyday. It would be great to see more viable options for what to do with our time when that happens. As a mom of four in my early 30's I never felt like I couldn't go to school or have a career because of the church. I never felt like my dreams of school and education where ever stifled. It just didn't work out that way for many personal reasons. I have many girl friends who work mostly out of necessity- it is hard to raise a family on just one income. I am proud of my friends for their leadership outside the home and the moms they are when they are home. I have friends who have many home business and do quite well. I have friends who teach fitness classes at gyms and friends who run blogs that supplement their families income. The options are endless. As I spent a night with the local senior girls at a girls camp meeting they all got up and said what they wanted to do when they grew up. NONE of them said anything about being a mother. And you know what? It made me sad. Not that I don't think they should be able to pursue any career they want, but I felt like in a way they are missing a bit of the big picture. But I was the same way, my dreams of being a RN or a doula are still there and I would of done the same thing. But, when my youngest starts school I will pursue them. Was that how I wanted to finish school? No, but I still have a whole life ahead. Give yourself some grace. You were only taught to plan your life up until your 40's or 50's and I imagine you are not alone at all in how you feel. I think it can be similar to how infertile women feel when all of the sudden they can't have kids and didn't plan on anything different or women that haven't found a spouse yet and never imagined an alternative path in the interim (or perhaps for their whole life). Life is SOOOO long (usually) and there is much we can do within those years. There is so much time left in your life to pursue a degree, find something in your community that you are passionate about and volunteer, or maybe even a part-time job that could bring you great satisfaction. Why do we spend the majority of energy at church preaching to the young girls almost exclusively about motherhood when the "active" time of raising kids only lasts from about 22-30 years of our lives? (Depending on # of kids and spacing of course). That only represents %25 of a 100 year life. We also don't spend enough time on the realities of life and preparing for contingencies. In the church we strive for the ideal but live in reality where death, divorce, job loss, infertility, the economy etc. put us in the position of needing to work nevermind our desires either way. I grew up in a less active home, raised by a single working mom who spent her life as a secretary (and in and out of abusive marriages). Somehow it turns out to be a "blessing" to already be on the fringes of the church because I know I did not feel as much pressure to get married young, not go on a mission (I did) or drop out to have kids. I did feel the pressure however to "give up" my career and goals once I became a wife and mother. Imagine my surprise that getting married, having children, nurturing my family AND finishing my education and having a job could be in line with the principles of the gospel. My husband supported me in spending the first years of our marriage finishing my degree and performing. I was a dance major so taking a stroller to classes just wasn't gonna happen, and I felt only a little guilt in not jumping into motherhood right away. When we were ready to take the plunge - SURPRISE - I had fertility problems. Because I had prepared myself with a good degree I got to spend this difficult time of my life doing something I loved working full time teaching dance in a high school. I supported my husband in grad school and provided the health insurance that eventually gave us our twin babies. Without my degree it may have taken MANY more years to become parents. Now we have decided to home school and I am grateful for my rich education that helps me on this path of educating our own children. I continue to teach dance in our community which gives our family a little extra income and keeps my job skills fresh in case I ever need to become the sole bread winner again. We absolutely should encourage our girls to prepare themselves for motherhood and a family but it turns out that preparation for motherhood can and should look similar to preparation for any kind of fulfilling, gospel oriented life! Learn the gospel, get the best education you can, develop your talents, try hard things, have goals for work (with and without pay) and in all things stay close to Heavenly Father, Jesus Christ, and the Spirit to know how these things will work for good in your life. I think we have more than our current LDS culture to blame, as some have said, but I think the problem goes much deeper than relatively recent social norms. Once when I was distressed about the disparity between knowing that children needed a parent around as a primary care giver, and that many have God given talents that can't be very easily used in the home, prayed fervently to understand why this might be so. I thought about what most of our ancestors were doing not so very long ago: raising children in agriculture. Perhaps selling and bartering the produce in markets, to neighbors, or perhaps the work and skills of their hands. These men and women had their children with them in the fields and markets. It was normal, it was how they learned. I thought of Ellis R. Shipp, one of my heroes, a woman called to go back east to become a doctor to women who pioneered women's healthcare and saved many lives of women and babies not only directly but through her education of midwives. Her children helped her in the clinic and she often brought her daughters with her. For most of human life, our children have been by our sides while we worked. These people often were not blessed with the luxury to express their talents. So it IS a luxury. A blessing we can be grateful for. But I also felt prompted by this: our western society was shaped in a large way by men who were celibate. Who worked on religious and scientific thought without children (or women, really) around them. This changed the nature of their philosophies. These childless organizations are the ones that founded the education of our children, at first excluding girls. Allowing girls an education did not eliminate the many far reaching implications of a working and thinking life without children present. This sterile life was considered the ideal and one to be reached for. One of the reasons I find it difficult to self identify as feminist is because I believe it left Susan B. Anthony behind a long time ago, when it started to lobby for abortions as solutions, the least child friendly stance it could have taken. Look at how our colleges treat pregnancy. Ask for help and many times you're told (less so in Utah), abort or drop out. One of the starkest symptoms of child marginalization, and another voice saying that career aspirations and mothering aspirations are mutually exclusive. I guess what I identify as is a child centered religious humanist. I think that when children's rights come radically first, everything else falls into place. Order "Women at Church" by Neylan McBaine, a faithful and practical guide to improving the way men and women work together at church. More about the book.